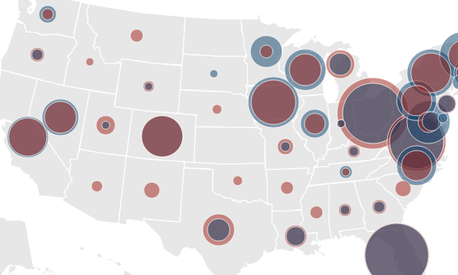 Romney and Obama have really hopped, skipped, and turned all across the country to campaign, as you can see in this fun animated map video of their campaign travels by statistician Jerzy Wieczorek. Using data from a Washington Post interactive on campaign stops from May 29 to October 25, Wieczorek plotted travel between different campaign events for Romney and Obama. The blue line represents Obama, and the red line represents Romney, with exact locations popping up below and above the map. Note: The video does not include trips home to D.C. or Boston. With those, the frantic hopping required to the campaign for president would be even more hectic.